Mini cheesecakes made just the way you like them. Top them with everyone's favorite fruit for a dessert that your family will love. 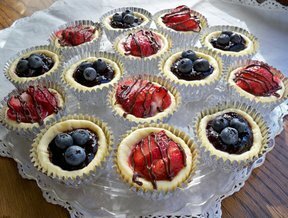 Use blueberries, strawberries & raspberries on these mini cheesecakes to make the perfect sweet treat for your 4th of July celebration. See step-by-step instructions for making this delicious homemade ice cream for a special cool and refreshing 4th of July treat. See how easy it is to make this patriotic Flag Cake to enjoy as part of your 4th of July celebration.